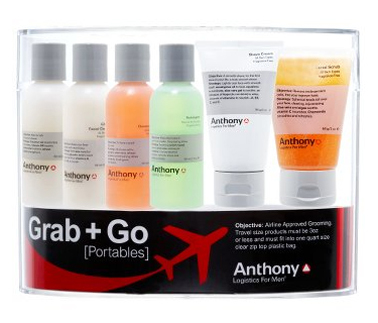 In a handy kit from purveyor Anthony Logistics, this ‘Grab & Go’ kit is perfect for a man who needs a skincare arsenal but doesn’t have the time to shop for individual items. With all the packages sized to meet airline restrictions, this kit is essential for anyone who’s hitting the skies and doesn’t want to risk having some costly skincare items confiscated, or worse, making a no-fly list. This entry was posted in Accessories, Body, Shaving, Shower, Skincare. Bookmark the permalink.